A wildly imaginative novel about a man who is reincarnated over 10,000 lifetimes to be with his one true love: Death herself. First we live. Then we die. And then...we get another try? Ten thousand tries, to be exact. Ten thousand lives to "get it right". Answer all the big questions. Achieve wisdom. And become one with everything. Milo has had 9,995 chances so far and has just five more lives to earn a place in the cosmic soul. If he doesn't make the cut, oblivion awaits. But all Milo really wants is to fall forever into the arms of Death. Or Suzie, as he calls her. More than just Milo's lover throughout his countless layovers in the Afterlife, Suzie is literally his reason for living - as he dives into one new existence after another, praying for the day he'll never have to leave her side again. But Reincarnation Blues is more than a great love story: Every journey from cradle to grave offers Milo more pieces of the great cosmic puzzle - if only he can piece them together in time to finally understand what it means to be part of something bigger than infinity. 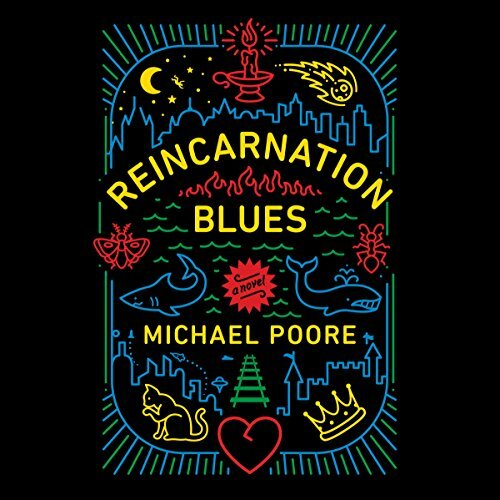 As darkly enchanting as the works of Neil Gaiman and as wisely hilarious as Kurt Vonnegut's, Michael Poore's Reincarnation Blues is the story of everything that makes life profound, beautiful, absurd, and heartbreaking. Because it's more than Milo and Suzie's story. It's your story, too. View More In Romantic Comedy.